Freshman midfielder Puck Pentenga faces off with a defender. Pentenga and the Wildcats outshot Ohio State 19 to 4 en route to a 4-0 victory in their Big Ten Tournament quarterfinal matchup Thursday. Once they started moving, the Wildcats did not let their foot off the gas, propelling them to a shutout victory over Ohio State in the opening round of the Big Ten Tournament. Northwestern (13-7, 4-4 Big Ten), the No. 4 seed in the tournament and reigning Big Ten Tournament champion, attacked the tournament’s No. 5 seed, Ohio State (9-10, 4-4), relentlessly Thursday in the Cats’ 4-0 win in the quarterfinal match. NU started the game off slowly, but following a media timeout, the Cats’ offense started to spark. NU outshot the Buckeyes 19-4 in the game and garnered 12 penalty corners — one of the Cats’ strengths during the regular season. 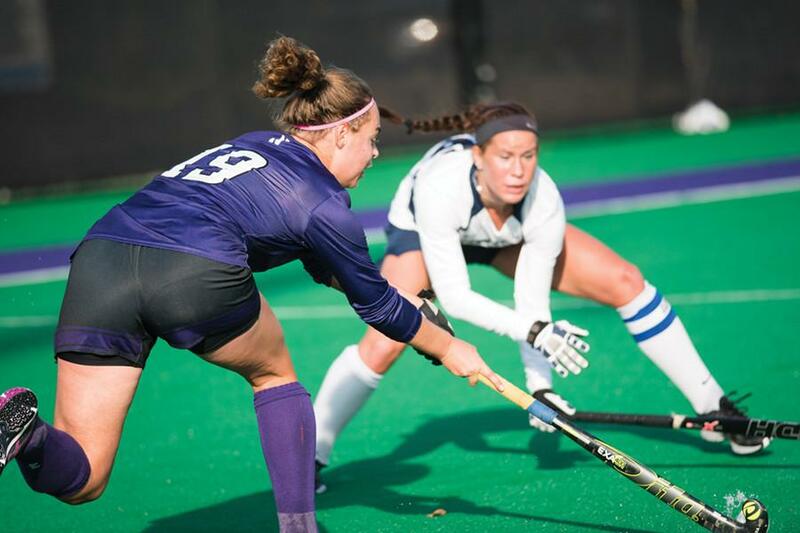 NU scored two of its first three goals off of penalty corners, igniting an offensive frenzy. Junior midfielder and leading scorer Dominique Masters scored the first goal of the game by following a missed shot and rebounding the ball into the net. She then assisted the third goal of the game when she took a shot off of a penalty corner and junior midfielder Lauren Bernardi redirected the ball past the goalkeeper. This is the second time in less than two weeks the Cats faced Ohio State, and in both games NU’s defense shutout the Buckeyes. NU’s defense held Ohio State to only putting one shot on goal and conceded only three penalty corners the entire game. Senior back and All-Big Ten first-team honoree Lisa McCarthy said the defense frustrated Ohio State’s offense, including fellow All-Big Ten first-team honoree, Peanut Johnson. The Cats’ path to defending their Big Ten Tournament title only gets more difficult from here, as NU prepares for a quick turnaround against top-seeded Maryland on Friday. When the Cats last played the then-No. 10 Terrapins on Sept. 18, Maryland came away with a close 3-2 win over NU. Masters said the team is lucky to have played the earliest game since they will get the most rest of any team in the tournament, and the team is treating Friday’s semifinal game as a final.